It is an uphill climb for the elk. Now that the breeding season of the fall is nearly over, the elk have to regain their strength and gain much-needed energy and reserves for the winter. 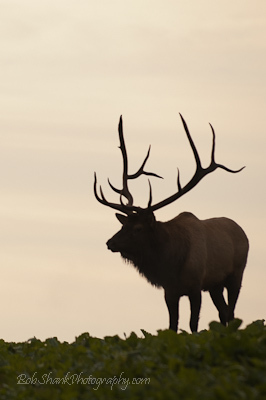 The winter season can be harsh on the elk range and survival depends greatly on preparation. If an elk does not prepare well, it will die in the brutal weather brought on during the cold winter months. This photograph was captured on the last week of September and while it shows a nice bull elk starting to walk up the hill, I think it foreshadows the uphill climb required by all elk over the upcoming winter months. I do always find it amazing how one photograph can provoke us to think so much, and this photo is no exception. Is this merely a photo of one bull elk making his way up a hill in the fall, or does this photo have much more to communicate? There is just something special about a silhouette that is fascinating to me. I am not exactly sure what it is, but I do like silhouettes. Creating a silhouette is easy to do and with today’s digital cameras you get instant feedback to see if you got it right or not. 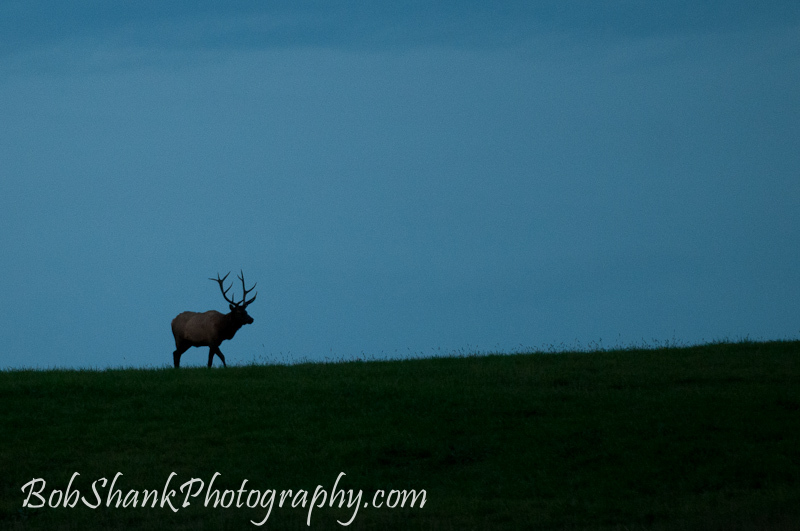 One evening this fall we were watching elk and this bull appeared on the horizon line. The sky was a tint of blue and conditions were just right for a silhouette. The method for creating as silhouette is to expose for the sky, which is the brightest part of the image. Here’s how I do it most of the time: I tilt the camera so that the viewfinder is filled with the brighter sky, then I press halfway down on the shutter release. This calculates the exposure setting in the camera’s computer. Then, while keeping the shutter release halfway down, I recompose the photograph in the viewfinder to my liking. Then I focus using the back button and press the shutter release all the way down to capture the image. Easy! Making a photographic silhouette is very easy and fun to do. The conditions required for this type of shot are back-lighting and a subject on the horizon line. 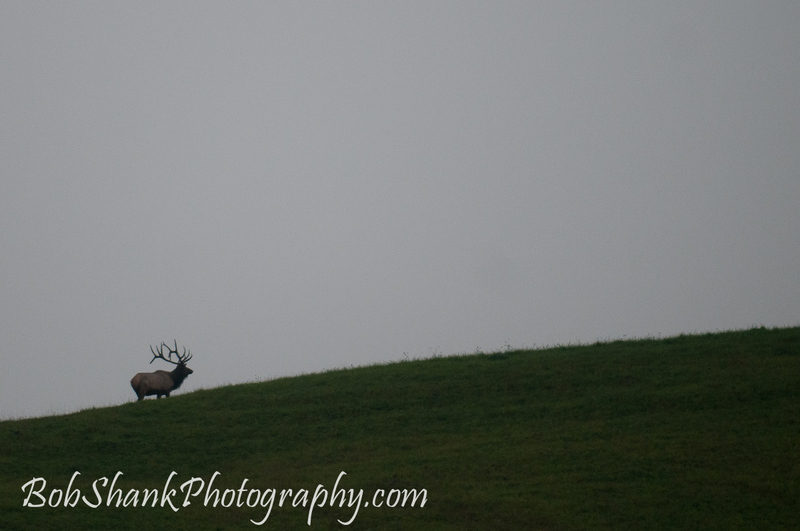 For example, in my photo here, the bull elk is right on the horizon line where there is nothing but sky behind him. This component of a silhouette shot is what makes the subject really stand out. The procedure to get a shot like this could not be easier. I just shoot my camera in the direction of the brightest part of the sky and take my meter reading from that location. Then I recompose the shot to include the subject right where I want it to be in my viewfinder. On this photo I paid attention to the rule of thirds and kept the subject in the lower-right third of the image. Give it a try. Making a silhouette is fun and easy. And the results can be stunning!